But seeing that here in the valley we’re all used to accepting what’s on offer, and that Mello is always a great experience no matter what, no one seems to be bothered in the slightest. It’s the equivalent of saying: we are Melloblocco (and we’re with Melloblocco) no matter what. And so we soak in and savor all this beauty. This is what the almost 1500 (!) boulderers seem to think, all those who’ve already made their way into the valley. They set off early this morning, as if obeying some ritual that needed following, in search of their boulder problems and their personal climbing goals. Because fun is always top of everyone’s agenda. Everyone in fact is free to search out, dream and interpret the game as they wish. Hence as you walk through the valley every „station“, pardon, every boulder, seems to experience a similar soul. It’s like a tune, a common rhythm, played by countless small communities that intertwine and untangle only to meet again (almost by chance or as if it were predestined) among the thousands of boulders in the valley. Some problems remain momentarily empty. Others fill to the brim. While others are courted by the same climbers from dawn till dusk. 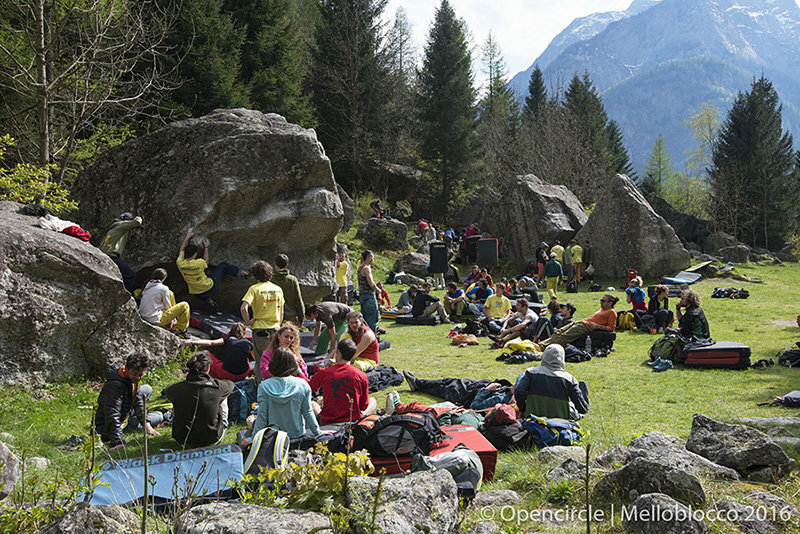 It makes no difference whether the rocks are an hour’s walk away, or a stone’s throw from the Mello Village: the climbing dance, successes, failures, joys and energy are always to the max. And beyond. Even when you bump into the valley’s biggest stone, Sasso Remenno, nothing changes. It welcomes all with open arms. Those who climb with a rope and top out on its large summit garden. Those who – protected by their faithful crashpads – aspire to sending the difficult problems situated on it’s many little brothers, strewn below or hidden close by in the forest. As it happens, this year there’s even a prize boulder sector nearby. Those reserved for the best boulderers. Those champions who, once again, have chosen to take part in this event. 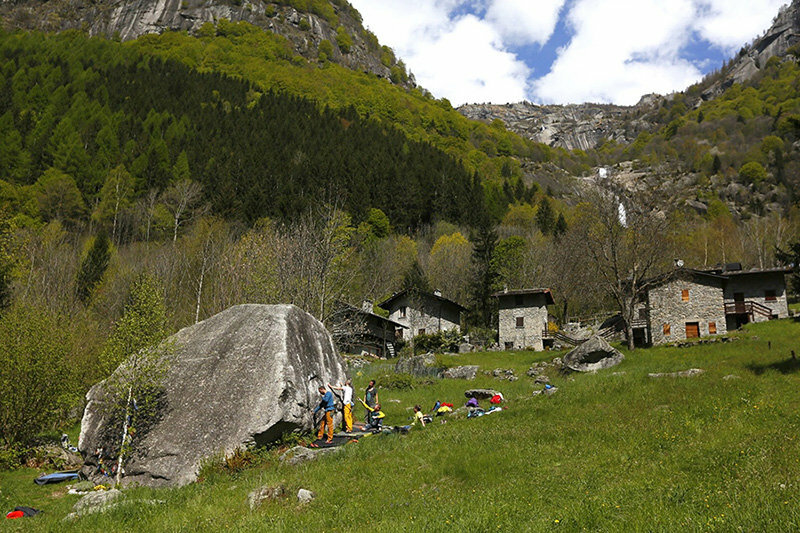 The 2016 edition, to name just a few of these top climbers, sees the likes of Frenchman Charles Albert, i.e. that incredible „barefoot boulderer“, flying Dutchman Jorg Verhoeven, Finland’s Anthony Gullsten, young South Tyrolean champion Michael Piccolruaz and the young Italian champion Stefan Scarperi. Women who have already left their mark are the Italian powerhouse Jenny Lavarda, Finland’s Annaliina Laitinen, Austria’s Madeleine Eppensteiner, the Russians Anastasia Grushchenko and Maria Dudakova, Holland’s Michelle Theisen and the Italian’s Anna Borella, Anna Aldè, Federica Mingolla, Annalisa De Marco, Irene Bariani and Martina Frigerio. Perhaps Verhoeven said the most beautiful thing regarding the start of these 12 + 12 special problems: „they’re beautiful“. Simone Pedeferri – the maestro who year in year out discovers these lines – greeted these words with a smile. Yes, his mission is Mello beauty. A beauty that remains in and for the valley, one which everyone would like to climb. Talking about Mello things for everyone. As usual there’s the special Mello beer, brewed according to the special Melloblocco recipe. While novelties include the new Vertical Life App which serves not only as a compass to locate the problems, but also to play here at Mello. 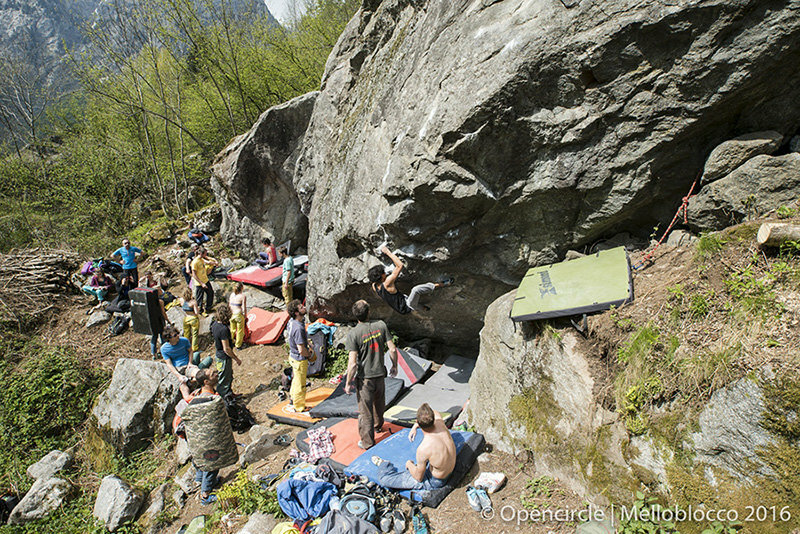 Another novelty: the new Climbing Radio Web (by Versante Sud) inaugurated here at Mello. It may well be chance, but things seems to come to life here, with the social and free Melloblocco spirit. This evening the celebrations will obviously continue and tomorrow… they’ll be more climbing.